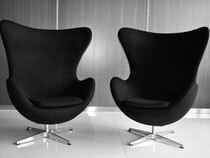 Egg chair is a chair designed by Arne Jacobsen in 1958 for Radisson SAS hotel in Copenhagen. It is manufactured by Republic of Fritz Hansen. The Egg was designed in a typical Jacobsen style, using state-of-the-art material. It is believed to be inspired by Eero Saarinen's "Womb chair", from which it gains some traits. In many respects, though, the Egg is a much more complete design. Related to the Egg is the Swan and, to some degree, many of Jacobsen's plywood chairs such as "7", the Ant, the Cigar, the Grand Prix-chair, the Pot, the Drop and the Giraffe. The Egg was (as was the Swan) designed as a couch also - though the actual piece was thought to be a figment of someone's imagination, fed by the existence of the Swan-couch. While the Swan-couch is still in production, only a handful of Egg-couches have ever been made. A few were made for the Radisson Hotel, and a few years back, some were made as a "special edition" couch. The price was quite high - about 400.000 dkr., the equivalent of 60,000 USD. The reason for the limited production of the Egg-couch, besides the wish for exclusivity, is the difficulty involved in making it, plus a design-"flaw"- the couch is too big to be covered by two entire cow-hides, which is only just possible with the Egg-chair. This leaves a very visible stitching down the middle of the couch - definitely not in Jacobsen spirit. This problem can, however, be solved by making the upholstery in fabric rather than leather. According to a New York Times article, the Egg chair has also been used by McDonalds as part of a high-concept redesign of one of its restaurants in London. Furthermore The Egg is in McDonalds on Nørrebrogade in Copenhagen, amongst orther furniture by Arne Jacobsen, although some being imitations.